Aaand I just learned that director Chloé Zhao is doing the Marvel Eternals space gods film so that’s weird. I thought that this movie was great, and I also thought it was really weird that the MCU folks looked at it and thought welp, she's for us. But if you think of it as a genre movie, which in a weird way it is—neo-realism smashed together with the Western—then it makes more sense to me that she could do interesting things with a Marvel movie. 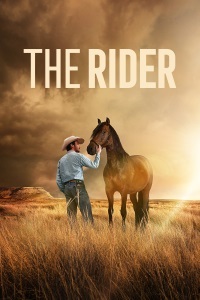 And I also think that what makes The Rider really good is that genre collision—the myth of the West as still alive but as ungraspable as ever for these extremely specific people; the acute realization of physical frailty as always part of the glamour of the rodeo, but worn differently for Brady now that the possibility of death is more alive for him than his friends. So I guess I can see how the sensibility would transfer, though I'm not sure how her aesthetic will. I haven't had the chance to see this yet, but I was hooked by the interviews with Jandreau and Zhao on Fresh Air this spring.